University of Iowa Libraries Special Collections is pleased to announce the acquisition of the library and papers of noted Romanian-American writer Andrei Codrescu. 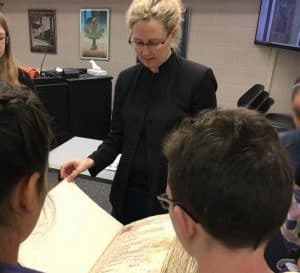 Comprising approximately eighty linear feet of manuscripts, books, audiovisual material, digital media, art works, and ephemera, this acquisition is a major addition to the University Libraries’ literary collections, and will provide a treasure trove of material for researchers in a variety of fields. Andrei Codrescu was born in Sibiu, Romania in 1946. 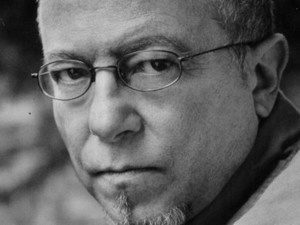 His literary career began with a number of poems written in Romanian when he was in his teens; it was during this period that he changed his surname from “Perlmutter” to “Codrescu.” Emigrating to the United States in 1966, he soon started writing and publishing in English. Living first in Detroit, he moved to New York and then to California, coming into extensive contact with the New York School of poets as well as the Beats. He held teaching positions at Johns Hopkins University and, for many years, at Louisiana State University, commuting by Greyhound bus to Baton Rouge from his home in the French Quarter of New Orleans. 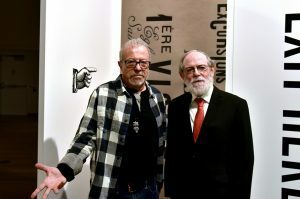 Since his retirement from LSU, Codrescu has been living in New York City while maintaining a rural retreat in the Buffalo River Valley in northern Arkansas, where besides writing he has been experimenting with sculpture and collage-constructions. Codrescu is perhaps best known for his regular commentaries on NPR’s All Things Considered beginning in 1983. His writing encompasses virtually every genre, including poetry, novels, short stories, plays, essays, book-length non-fiction, autobiography, and film scripts. 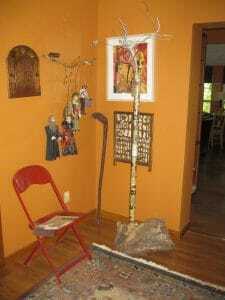 In recent years he has resumed writing poetry in his “native” language, Romanian. (Romanian was actually his third language, since as a child growing up in Transylvania, he first spoke German and Hungarian.) Besides his numerous books of poetry and his novels, Codrescu’s most influential books include The Hole in the Flag (an account of his return to Romania as an NPR reporter just days after the 1989 revolution), The Disappearance of the Outside, The Posthuman Dada Guide, Bibliodeath, and a series of innovative autobiographical works. He is also well-known for editing the journal Exquisite Corpse, named after a surrealist game. 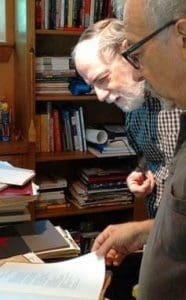 Andrei Codrescu has longstanding connections with Iowa City’s literary scene, having been friends with a number of local authors. 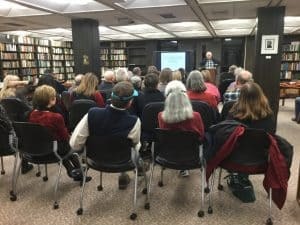 His library is filled with dedication copies of books by Iowa writers, former participants in the International Writing Program, Beat poets, Romanian authors, and major figures representing every strand of contemporary American literature. 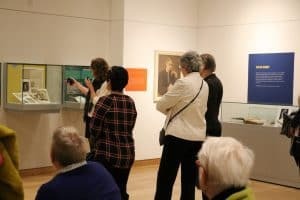 In February of this year Codrescu presented a lecture-performance in connection with the Libraries’ exhibition Documenting Dada, Disseminating Dada; the video is available online. During his visit, he met with a variety of groups on campus, including the School of Library and Information Science, the MFA Program in Translation, the International Writing Program, and library staff. 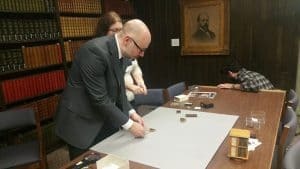 Discussions began with Special Collections staff concerning the possible acquisition of his papers, and in August librarians Tim Shipe and Amy Chen visited Codrescu’s Arkansas studio to inspect the collection and discuss terms. 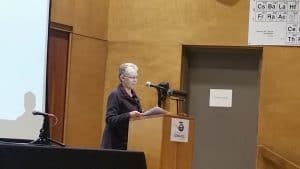 Following the successful conclusion of these discussions, the collection arrived at the University Libraries in mid-October, and is now in the preliminary stages of processing. An art installation on the theme of post-communism, on site at Codrescu’s Arkansas studio; now in University of Iowa Libraries Special Collections. Among the highlights of the collection are three unpublished novels, manuscripts, correspondence, and ephemera related to the author’s published books (including the Romanian flag with the Communist symbol cut out that inspired the title of The Hole in the Flag), communications concerning assassination threats from the Romanian secret police, documentation of exhibitions, and a number of two- and three-dimensional collages and art installations. Also included are back-up copies of pre-1990 manuscript materials now housed at Louisiana State University. Codrescu’s library includes annotated books that Codrescu used during his research for his novels and non-fiction prose works. Also included is a comprehensive collection of Codrescu’s books, including some proof copies with manuscript revisions. Andrei Codrescu’s collection promises to be a fruitful resource for researchers for many years to come, and a new draw for visitors to America’s first UNESCO City of Literature. 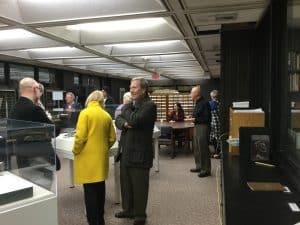 Late October and November were filled with big events in Special Collections and the Iowa Women’s Archives. 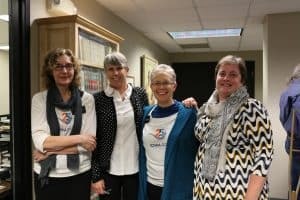 The November meeting marked the 15th anniversary of the group. 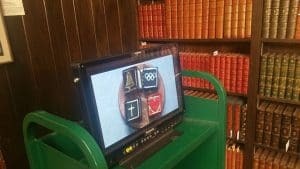 In celebration, the evening’s talk was given by Arthur Bonfield, who gave the inaugural Bibliophiles talk in November, 2002. 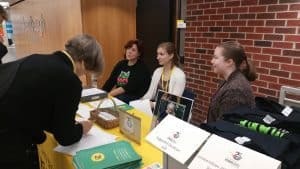 The Iowa Women’s Archives celebrated their 25th anniversary with an open house, a gallery tour, a gala dinner, and a full day symposium. 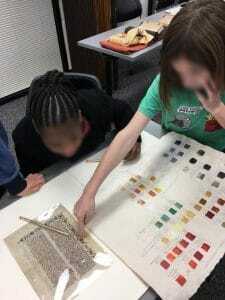 Teaching with Medieval manuscripts was a theme this month. Special Collections librarians and graduate student workers from the School of Library and Information Science all worked together to bring in all eight sections of the Medieval Art survey course Cave Paintings to Cathedrals (ARTH:1050:0A01). 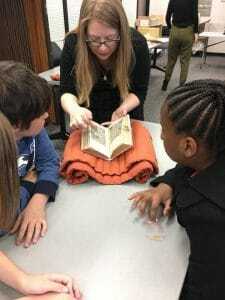 Also this month Center for the Book faculty member Melissa Moreton partnered with librarians and graduate student workers to bring in two fifth grade classes from Horace Mann Elementary School to test a lesson teaching young students with medieval manuscripts. 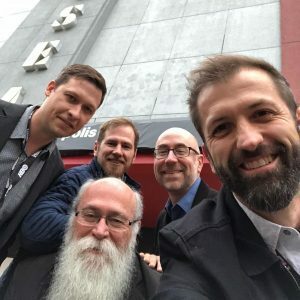 The documentary “Saving Brinton” premiered at DOC NYC. 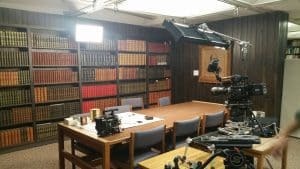 The documentary features a collection of very early motion pictures that are now housed in Special Collections. See a selection online. 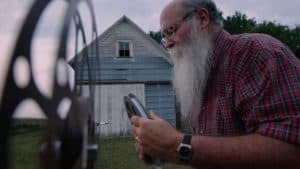 The documentary continues to play at film festivals around the country before a wider release next year. More. 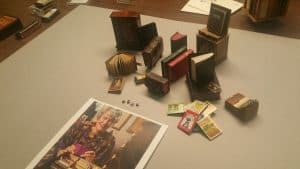 NBC Nightly News filmed a segment about miniature book creator, collector, and donor Charlotte Smith, and School of Library and Information Science student Bethany Kluender who has cataloged one thousand of the tiny books. The segment will air sometime in the next month. The C. Maxwell Stanley Hydraulics Laboratory at the University of Iowa is one of the nation’s leading fluids-related research centers. Established in 1920, it is also historically significant. Recently the University Archives acquired a set of daily journals maintained by the laboratory’s first director, Floyd Nagler of the College of Engineering faculty. The typewritten logs document activity at the laboratory from 1921 to 1933, its first dozen years of operation. During this time, the laboratory was formally established as the Iowa Institute of Hydraulic Research (IIHR), and in 1932 ground was broken for the present-day structure on the west bank of the Iowa River. 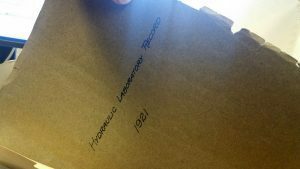 The journals have been added to the Records of the Iowa Institute of Hydraulic Research (collection no. RG 10.0006.001) and are open for research. The Dept. of Special Collections expresses its appreciation to Dennis A. Hill for making this acquisition possible. To learn more about IIHR’s history, go to http://www.iihr.uiowa.edu/about/history/. Freaky Fridays are back in Special Collections! Be on the lookout for Hawkeye Ghost's spooktacular adventures this month.